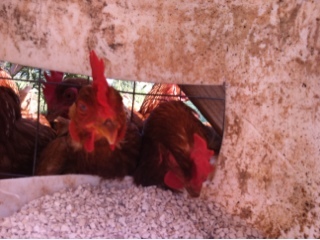 The laying hens live in their mobile pens year round. The pens make it easy to provide them with clean ground, and to protect them from all that wants to eat them. Yesterday was maintenance day on the pens. Work is completed while the girls are on there, as the moment they get lose the hawks and sometimes the eagles are here to hunt them. 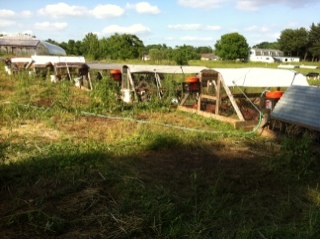 Oyster shells are now in buckets attached to each of the 8 laying hen pens. Refill for us is easy, and the hens have it whenever they want it. It helps replace the calcium they use up making so many eggs. Every water bucket scrubbed and the lines cleared. Weak spots reinforced. Wheels aligned. Next, later today, the turkey pens get roosts. The turkeys are large enough to use them at night, and appreciate getting up off the ground.